The purpose of this site is to provide a little help to those that are looking for written material about Frank Zappa. 21 April. Expect The Unexpected by Kent Nagano. This book was issued in German in 2014 and in English in March 2019. Part of the chapter 4, six pages, is "Frank Zappa, or The Serious Side of the Artist". 20 April. From Montana - Borrowed Times, September 15, 1974. Article "The Notorious Zappa" is about Apostrophe album. 19 April. Three issues of the Czech music monthly Melodie - April, September and October 1977. 19 April. The Paper, July 15, 1968, and the Lumpy Gravy review "Zap And Other Hungers". 18 April. British fantasy and science fiction magazine Stardock, January 1970. Page scans added. Contains interview with FZ "Grandson of Ives". 18 April. Dutch Oor, March 24, 1976 containing interview with FZ. 14 April. San Francisco Examiner, July 10, 1966, includes some good words on Freak Out! 13 April. Czech Melodie, March 1985, with translated Frank Zappa interview. 13 April. In a moment the oldest entry in our collection, where Frank Zappa is named. The Bakersfield Californian, August 13 1965 issue contains a Run Home, Slow ad with composer's name. 13 April. Long Live Vinyl, December 2018. Short review of the Hot Rats. 12 April. French Les Inrockuptibles, March 2019 issue about the year 1969. 12 April. Mojo, May 2019. "Zappa's Holo-spectre Spooks London, As A Play Remembers The Days". 12 April. Los Angeles Free Press, December 31, 1965. "A Year End Garland from the Free Press" where The Mothers Band is named. 9 April. Los Angeles Free Press, October 1, 1965. This issue includes an article about the movie The World's Greatest Sinner, but composer Frank Zappa is not mentioned. 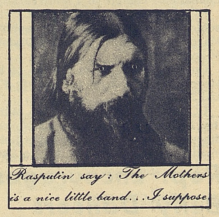 However, on page 6 is an ad "Rasputin say: The Mothers is a nice little band ... I suppose". This ad was repeated several times in next Freep issues in October and November 1965. 8 April. Record Collector News, issue 74, April 2019. 2019 is the year of Frank Zappa with The Zappa Hologram Tour and the 40th Anniversary Of Zappa In New York. Interviews with Ahmet Zappa and Joe Travers included. 5 April. Dutch Hitweek, March 1, 1968. Articles on Beefheart and Zappa. 2 April. German fanzine Arf Dossier. Issue #99 arrived. 1 April. Record World, August 13, 1966. "N.Y. 'Freak Out'", about Freak Out! campaign in record shops. 31 March. Record World, July 9, 1966. One very early article on Freak Out! – "MGM Goes Way Out For 'Freak Out'". 31 March. Dutch Oor, August 30, 1972. 30 March. Los Angeles Free Press, August 18, 1972. Contains long interview with Mark Volman and Howard Kaylan, "how two ex-Turtles left the Mothers of Invention and became the Phlorescent Leech & Eddie". 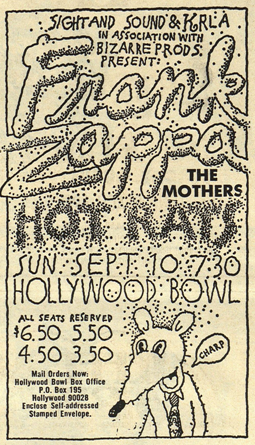 A nice Hot Rats (actually Grand Wazoo) concert ad is also included. 30 March. Melody Maker, February 15, 1969. Ruben & The Jets reviewed. 29 March. Rolling Stone France, April 2019. "Rats en fusion! ", a 5-page article by Dominique Dupuis. 29 March. Beat Instrumental, July 1968. We're Only In It For The Money review. 18 March. "The serious side of Frank Zappa" - article based on an interview with FZ a month before A Zappa Affair concert. San Francisco Examiner, May 18, 1984. 16 March. English-language music monthly from Greece – Burst. Two issues, May and November 2014, with articles on Zappa. 15 March. It's Only Rock 'N' Roll, an indie music newspaper from San Antonio, TX. The November 1981 issue contains Zappa concert review. In December 1981 edition is included You Are What You Is review. 14 March. Belgian cultural quarterly magazine Staalkaart, #24, Spring 2014. 9 March. FZ88 is a limited edition hardback coffee table photo book of Zappa’s last tour, based around the photos of Sergio Albonico who had exclusive access to the band during rehearsals. It is augmented with photos from the tour as well as narrative by Zappa author Andrew Greenaway. 4 March. Melody Maker, November 2, 1968. October 25 Royal Festival Hall late show review by Chris Welch – "Who Would Have Thought The Mothers Could Be Boring?" 26 February. Dutch Muziek Expres, January 1972. Four pages on 200 Motels. 25 February. Dutch bimonthly Heaven, #2, 2018. Contains article on Frank Zappa and interview with Dweezil Zappa. 24 February. "Zappa: Now It's Time For Gravy", interview with Zappa about planned Lumpy Gravy talk show and other things. Disc And Music Echo, November 8, 1969. 23 February. Classic Rock, issue 259, March 2019. "100 Greatest Albums of the 60s" includes We're Only In It For The Money and Hot Rats. 16 February. The first volume of the new trilogy devoted to Frank Zappa – Les Extravagantes Aventures de Frank Zappa by Christophe Delbrouk. 15 February. Russian Smena, July 1994, with a long profile article on FZ. 14 February. Three issues of the Japanese monthly Ongaku Senka, February, March and April 1976. Several articles on Zappa visiting Japan included. There are also some interviews that have been partially translated. 12 February. Russian Rovesnik, February 1990. 11 February. From Italy, Blow Up, February 2014. 16-page article about FZ in the '80s. 9 February. Two 1969 issues of Aloha. Issue #5 has a cover story on Wild Man Fischer. Issue #15 contains article on Uncle Meat film. 8 February. Italian monthly Blow Up, December 2010. In this issue is the article "Dio Fa. A lost project." This is all you need to know about proposed by Frank Zappa, but not accepted by Milan, world cup football opera. Includes interview with Fabio Treves, the only Italian musician who has performed on stage with Zappa. 6 February. Sounds, December 5, 1970. This issue contains interviews with Frank Zappa ("The Sounds Talk-In. Frank Zappa"), Aynsley Dunbar, Ian Underwood and George Duke ("Mothers In Town "). 5 February. Aloha, #10, September 1969. Mothermania album review. 4 February. Dutch underground paper Aloha, #38, October 1970, with Weasels Ripped My Flesh review. 2 February. A peculiar interview by Roy Carr with Frank Zappa at his house – "Bizarre goings on with Uncle Meat". Published in New Musical Express, April 7, 1973. 31 January. French translation of Them Or Us, published in September 2018 by Philharmonie de Paris. 28 January. New Musical Express, May 25, 1974. Included is interview from the 10-year anniversary of the Mothers of Invention, "Mother's Day memories". 27 January. New Musical Express, January 3, 1976. Contains great article by Miles about Frank Zappa, Captain Beefheart and their working relationship. "BLLLAAAaaaaahhhhhHHHHHH – You have just heard Captain Beefheart shattering glass objects with the astonishing pitch of his voice". 26 January. Sounds, December 4, 1971. Interview with Frank Zappa by Steve Peacock – "Frank's turtles in disguise". 26 January. Russian quarterly Music Box #70, 2015. Contains interview with Chad Wackerman. 25 January. Melody Maker, September 21, 1968, with Royal Albert Hall concert ad. 24 January. Melody Maker, August 17, 1968. News on the front page – the Mothers are coming to London. 22 January. Italian monthly of alternative and obscure music – Blow Up, December 2018. This is a Zappa special issue to commemorate the 25th anniversary of death with 24 pages devoted to FZ. 22 January. Lizard, Summer 2014. A quarterly from Poland. 21 January. Portuguese weekly Blitz, January 1985, with an overview article about Zappa's last 20 years. Included in this issue is also an article on Captain Beefheart. 21 January. Polish quarterly Lizard, Autumn 2012. Contains article on Zappa albums and interview with Chad Wackerman. 9 January. Two nice interviews more. Melody Maker, July 11, 1970. "Listen With Mothers" is an interview wirh Frank Zappa. "Zappa’s so straight he’s bizarre" is interview with George Duke. 8 January Marvel comics Two-Gun Kid, March 1968, with We're Only In It For The Money ad. 7 January. British Beat International, December 1968, with Lumpy Gravy review. 31 December. Third interview in 3 days, not bad. "The Incurable Frank Zappa" is about unhappy Paul Simon and common concert with Simon & Garfunkel, the Rolling Stones, jailhouse, Mothers' audience, politics. Taken from Record Mirror, June 7, 1969. 30 December. From Chicago – Psyche Pscene, March 1969. Contains interview with Frank Zappa. 29 December. In October to December 1974 ten issues of New Musical Express included 4-page pullout titled "The Guitar Book", 40 pages in total. It featured a series of articles by Fred Frith (of the legendary band Henry Cow). 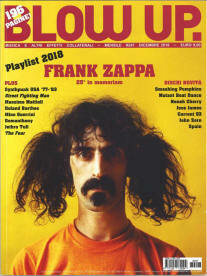 November 16 issue included article 'Great Rock Solos Of Our Time - Frank Zappa: "Nine Types Of Industrial Pollution"'. 26 December. A new Dutch book on Zappa for a long time – Zappa: Controversieel Componist by historian and Zappa freak Peter Sijnke. Published in November 6, 2018. 25 December. Down Beat, March 2016. 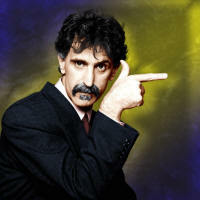 Geoff Wills' book Zappa And Jazz: Did It Really Smell Funny, Frank reviewed. 17 December. Polish Jazz Forum, January 1994. Yellow Shark review. 15 December. How nice it is to get every three months another Arf Dossier fanzine. #98 is out. 15 December. Relix, October-November 2017. Absolutely Free review. 12 December. Relix, December 2015. Gail Zappa obituary and Roxy: The Movie review. 12 December. New British magazine for vinyl collectors and enthusiasts Long Live Vinyl, July 2017. 9 December. Student newspaper The Long Beach Union, December 16, 1985, with "Mothers of Prevention. An interview with Frank Zappa". 9 December. Sounds, October 20, 1984, including Them Or Us review. 7 December. Sounds, November 10, 1984, with interview "Total Freak Out". 2 December. Weekly student paper Argus/Dimension, October 4, 1974, with Roxy And Elsewhere review. 1 December. Guitar Player, December 2018. Jon Anderson, Adrian Belew, Mike Keneally and former Mother Don Preston recall the musical method behind Frank Zappa's perceived madness - "Make A Prog Noise Here". 1 December. Australian Record Club Magazine, v9 n7 1968. 30 November. Grapevine from Toronto, Canada. December 1, 1971 issue contains first part of the long story "200 Motels – Life On The Road". 30 November. Sounds, January 23, 1983. This British newspaper contains the interview "To Be Perfectly Frank" written by Edwin Pouncey. Most part of the interview is about composing orchestral music, Kent Nagaono, London Symphony Orchestra etc. Enjoyable read. 25 November. Short-living Russian magazine WM (World of Music / Мир музыки), was a joint venture of American Billboard and Russian edition Музыка. Issue #1, 1990, contains exclusive interview with Frank Zappa. Full text with translation is available. 25 November Polish Tylko Rock, September 1992. Article about "hard-working tyrant". 24 November. Alternative Rhythms, November 1985. "Zappa Says No!". 21 November. Dutch weekly Kink, March 1967. Contains Freak Out! review, one of the very first articles on Mothers in Dutch media. 21 November. From New Zealand, Hot Licks, December 1975, with an introductory article before Zappa's concert in Auckland in January 16, 1976. 16 November. Interview and profile in People, May 22, 1989. Including rare photographs by Harry Benson. 13 November. Four issues of Polish Teraz Rock, containing album or movie reviews. March 2014, December 2014, September 2015, January 2016. 12 November. Thorough interview with Frank Zappa by Chris Charlesworth "I’ll give the Queen a backstage pass". Melody Maker, January 1, 1977. 10 November. Interview "Head Mother Speaks". From Fifth Estate, December 1-15, 1967. Previous issue, November 15-30, contains ad and concert preview article "Mothers To Zap Detroit". 9 November. Dutch Muziek Expres, April 1980. Page scans of the interview added. 7 November. Three issues of the French cultural magazine Les Inrockuptibles from 2016 and 2018. Containing articles on Freak Out!, GTOs, Plaster Casters etc. 5 November. Interview and concert review "Zappa: Answering To His Own Image". Printed inthe student paper Argus, November 1975. Rare concert review where Norma Bell was a band member on sax. 4 November. Three volume set The Sixties In America. Printed in 1999. Covers all aspects of the three major events of the 60s: the social revolution; the Vietnam war and the Civil Rights Movement. 3 November. Two Czech samizdat bulletins, Voknoviny #4 and #6, 1990. 2 November. November 2, 1973 Detroit concert review – Kathy Dalton, Argent, Zappa. Fifth Estate, November 10, 1973. 2 November. Back to 200 Motels reviews. Radical Fifth Estate, December 23, 1971, with article "10, 50, 100, 200 Motels". 1 November. Down Beat, December 2018, contains a review of The Big Note by Charles Ulrich. 1 November. Polish Tylko Rock, September 1991 and May, 1992. 29 October. Three issues of Pelo from 1975: #59, #61, #67. 29 October. Another view on 200 Motels, written 47 years back. Underground paper from Chicago, The Seed, December 1971. 28 October. British alternative music paper Loud And Quiet, issue 84, March 2017. 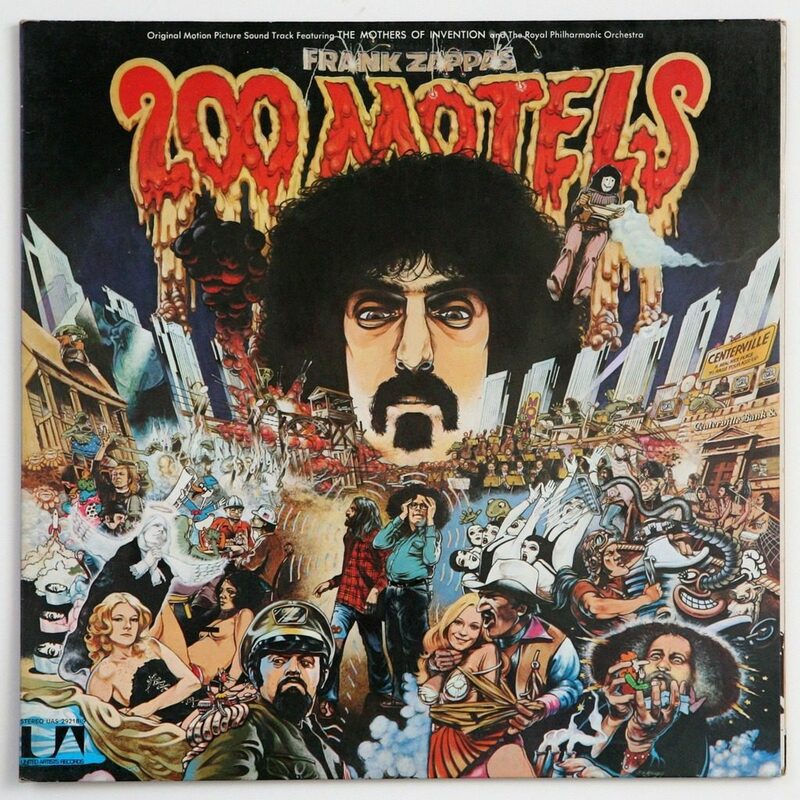 Today's view on 200 Motels with a summary: "I’d recommend you put down this magazine and put on some Frank Zappa right now – maybe the soundtrack to 200 Motels or one of the two albums I mentioned earlier (‘Hot Rats’ and ‘We’re Only In It For The Money’). But don’t watch this film unless you really have to." 28 October. Argentinian magazine Pelo, #46 and #53 from 1974. 26 October. Twenty-five years since his death, a remarkable unpublished interview reveals rock’s contrarian brainiac at his combative best. Mojo, November 2018. 25 October. Record Collector, July 2018. Luke Haines writes about mid-life crisis and mid-life Freak Out! 23 October. The Wire, March 2018. Absolutely Free: Expanded 50th Anniversary Edition reviewed. 21 October. Pasatiempo, The Santa Fe New Mexican's weekly magazine, February 2014. Cover story featuring Dweezil Zappa. 20 October. Very funny imitation of the 70s magazines. French Rock & Prog, April 1970, actually issued in April 2018, containing article on FZ and The Mothers of Invention. 20 October. Polish Non Stop, July 1979. Contains a fake news about the concert, where Vienna Symphony performed works of Frank Zappa. 20 October. Stereo Review, November 1983. Zappa's albums Volume 1 and The Man from Utopia reviewed. 20 October. Frank Zappa. 100 Saiten. A 100-page book by Ingo Meyer in German, published in September 2018. 13 October. The San Bernardino Sun, April 7, 1980. Includes interview "Frank Zappa remembers San Ber'dino" and a concert review. 7 October. Italian Rolling Stone, September 2014. 6 October. Rare Italian weekly Sound Flash, December 31, 1972, with extensive Grand Wazoo review. 6 October. Prog Italia, January 2017. Contains Zappa July 9 1972 concert review and interview with Mike Keneally. 3 October. Underground paper Counterpoint, February 25, 1969. Contains two articles on FZ and the Mothers, both available here. 2 Ocrober. Two issues of Spin - January 1986 and June 1988. 1 October. 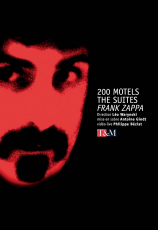 Right after the big Zappa weekend in Paris we can present here the voluminous program book of 200 Motels. The Suites. This book contains the full libretto of 200 Motels in English and French. The publication is readable in its entirety at calameo. Project X: The Authorised Biography of Frank Zappa by Alan Clayson - 2021 ??? This is a non-profit website, dedicated to composer Frank Zappa. Please help with the running costs of this website by making a donation. Disclaimer. I am not a copyright holder of any of these interviews/articles/photos unless expressly stated otherwise. This site is to document Frank Zappa’s legacy. If you own the rights to any of these interviews/articles reproduced here and do not want them reproduced here please let me know and I will remove the offending material immediately.